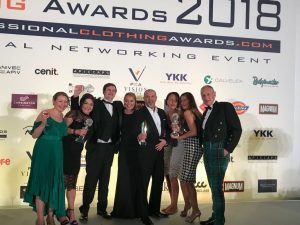 On Wednesday 20th June the Hunter team attended the UK National Awards for the Professional Clothing Industry at the Park Plaza London Riverbank Hotel and were joined by the senior team from Virgin Trains. What an outstanding night for both Hunter and Virgin. Natasha Grice, HR Director at Virgin Trains won ‘Woman of the Year 2018’; Hunter won ‘Best Managed Major Contract’ with Virgin Trains for our project which saw us roll out 3,500 new uniforms, developed and manufactured by Hunter. Hunter also won a shared award with Virgin for ‘Best Business Manager’ and was highly commended in the ‘Made in UK’ award. Quite a celebration by the Hunter and Virgin team!! Pictured above; the Hunter and Virgin teams on awards night.